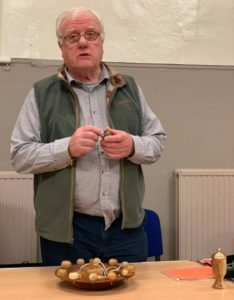 Peter Morgan explaining his Dueling Doughnuts. 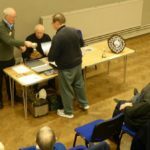 This year we decided we would have a change from the last few years and hold the AGM after the annual competition awards this month. 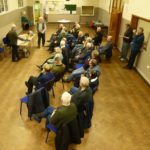 As only members are allowed to attend that part of the meeting nothing can be reported. 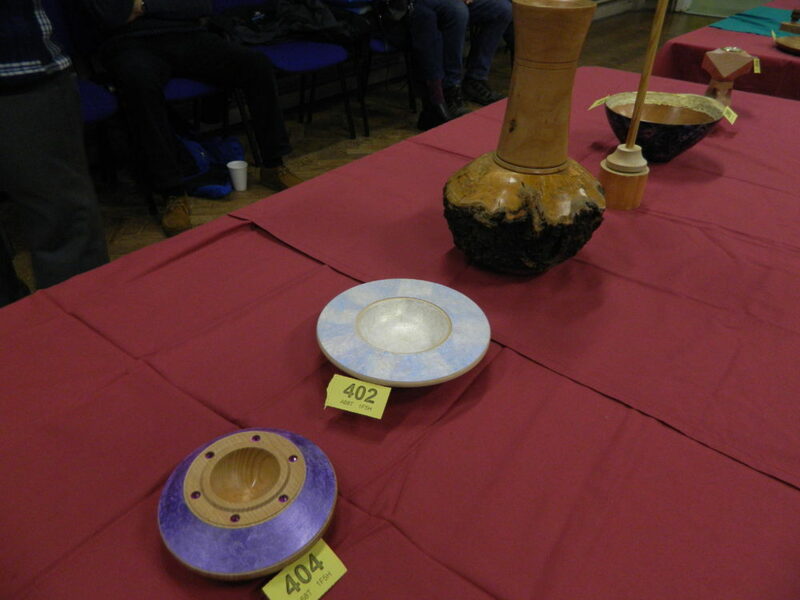 Only to say that all the officers were unopposed and this year is the same as last year. 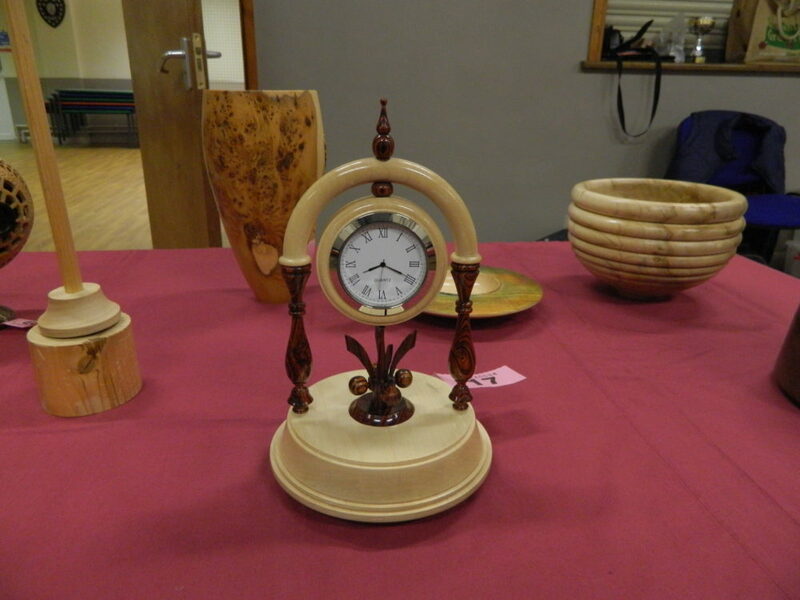 Dave Harding’s Clock with oscillating movement. 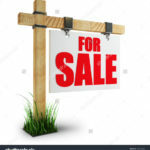 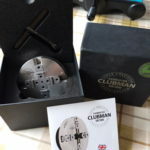 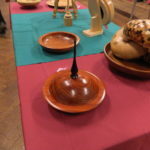 As part of the annual competition in December, after results are announced, those who are willing gave a brief description of how the item was made. 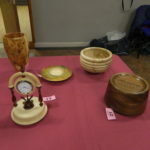 Dave Harding was first to explain how he went about making his Maple and Cocobolo clock that won best in show prize (see above left). 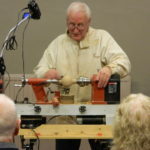 Below the clock face the Cocobolo feature oscillates by means of a movement below the maple base. 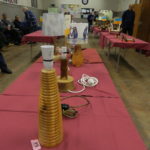 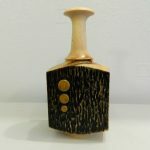 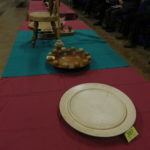 I then gave a brief description of the Maple Pinocchio clock I had entered that came 4th in the advanced large section. 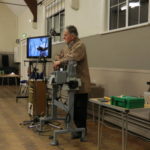 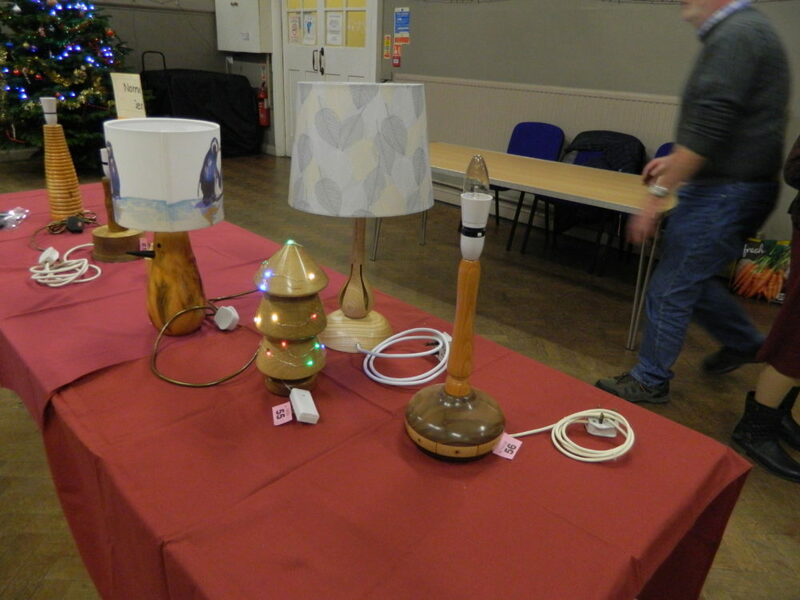 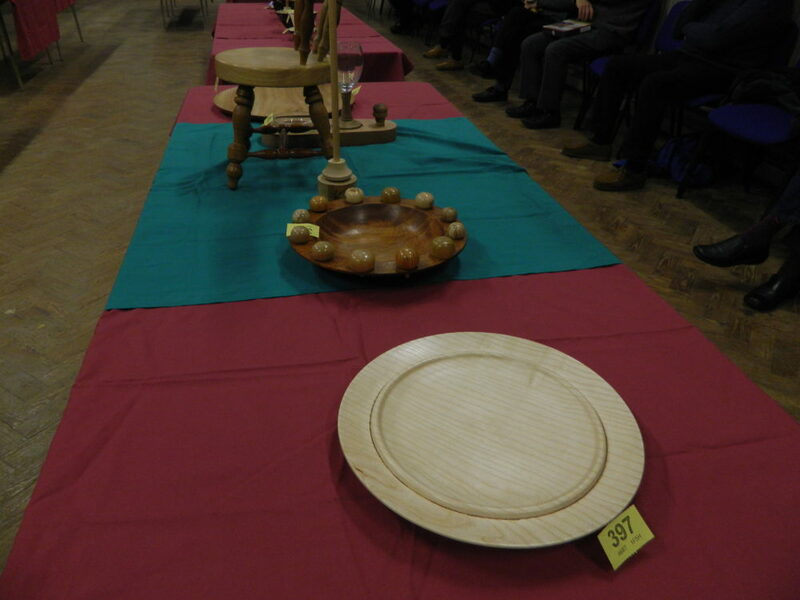 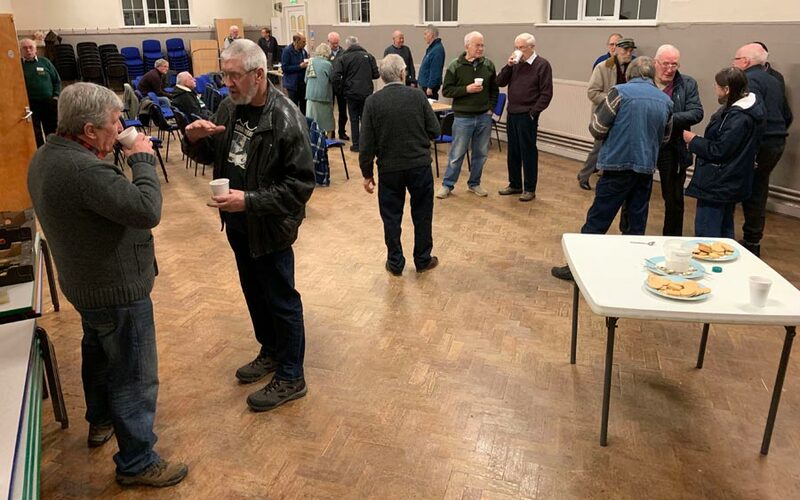 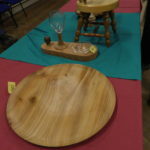 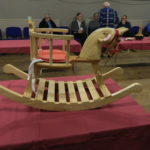 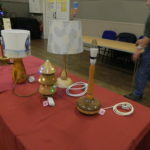 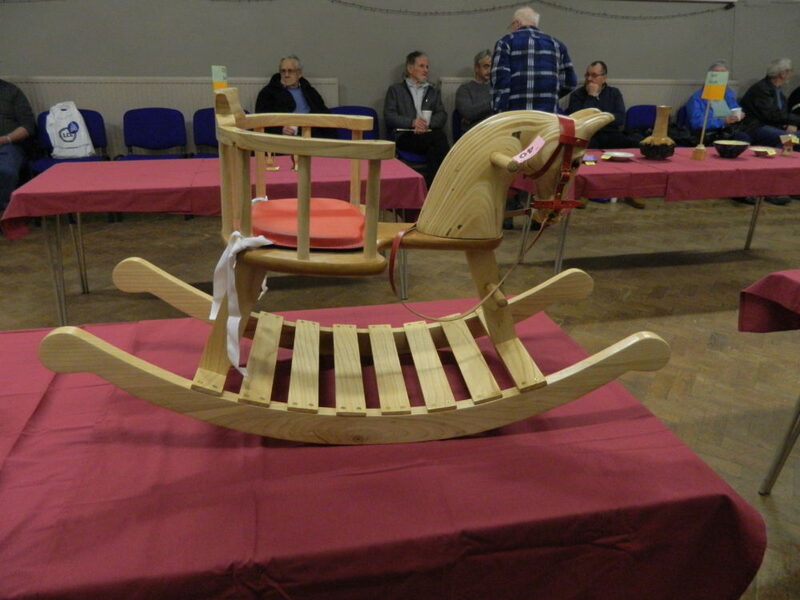 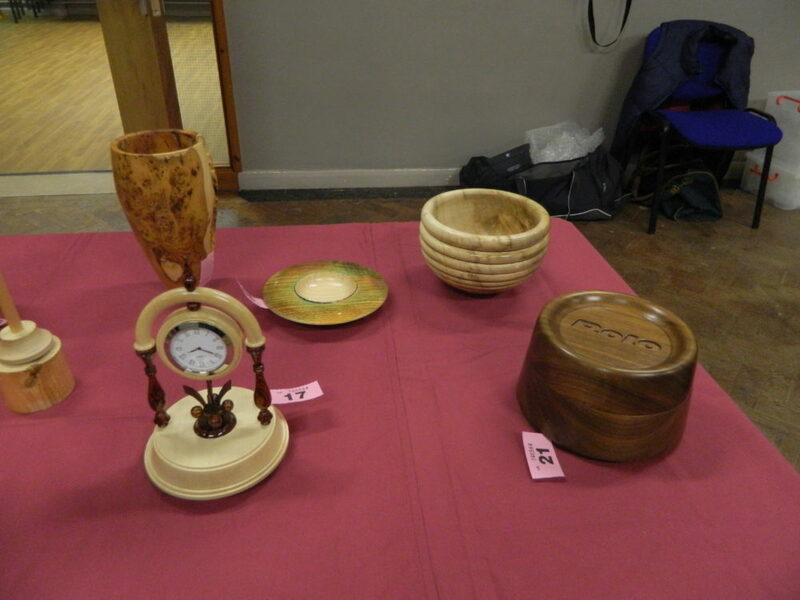 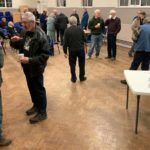 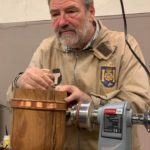 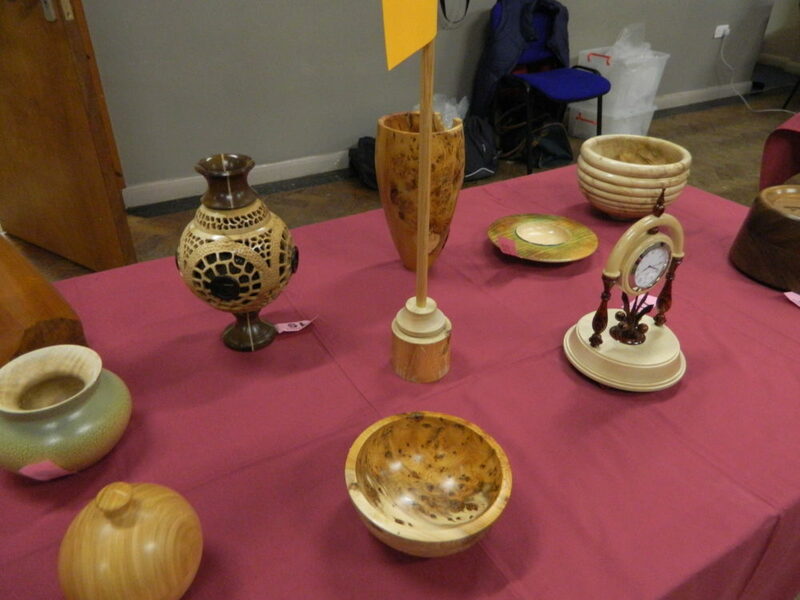 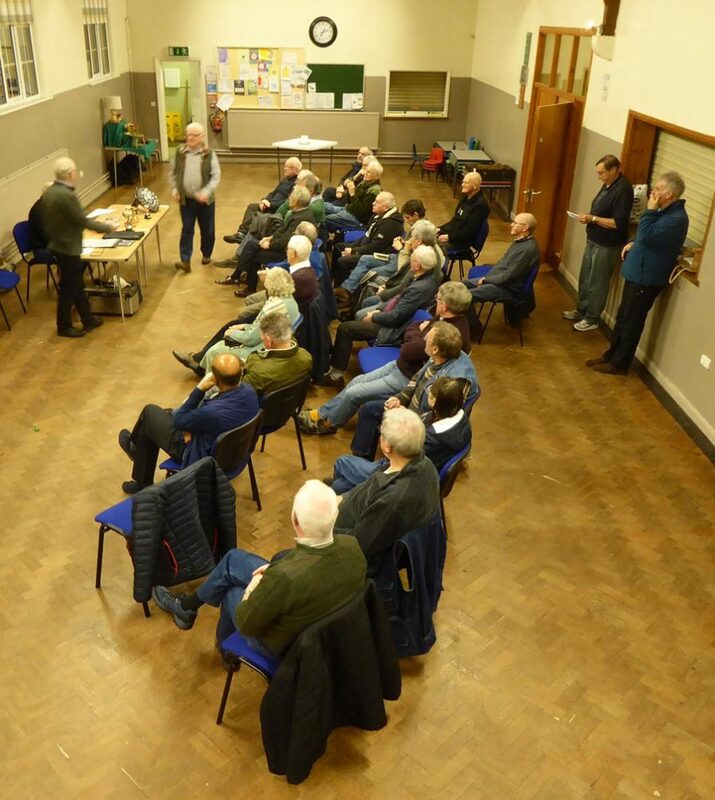 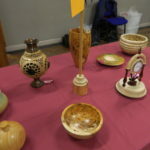 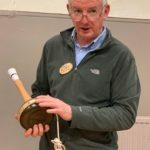 After the award presentation in January some members who were unable to attend the yearly competition gave a brief description of how their winning items were made. 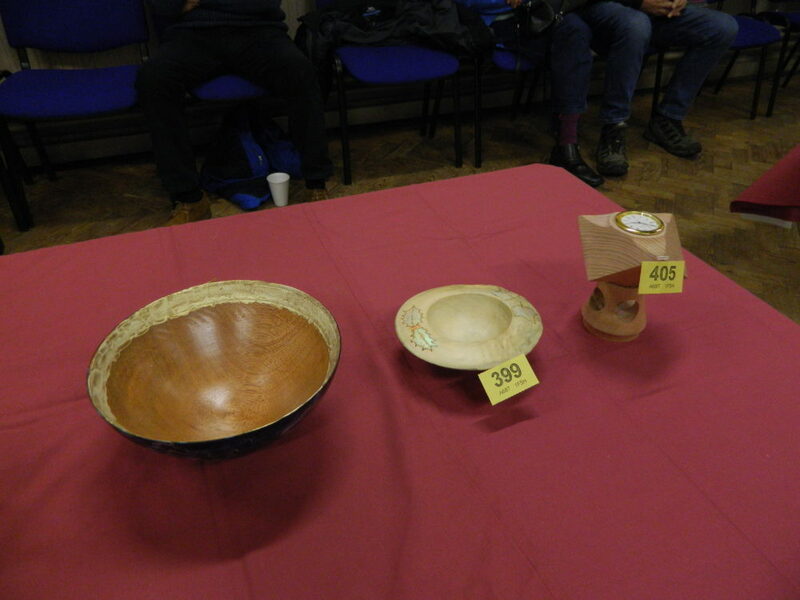 Dave Workman with his bowl and Tippy Tops. 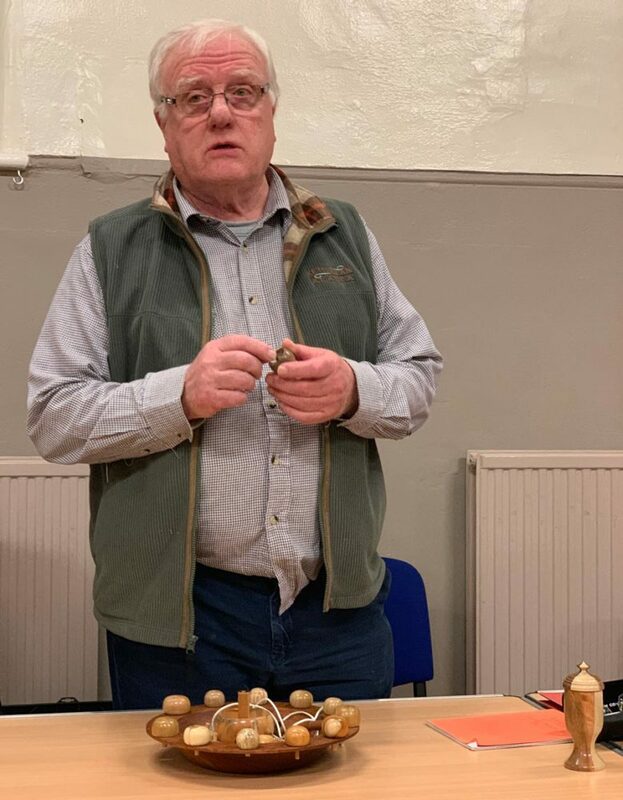 Peter Morgan started off by describing his Box wood spiked star in a sphere and explained the large amount of tooling that was needed. 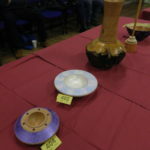 He then went on to explain how he made the vase within a vase and the problems encountered. 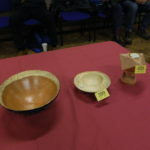 Lastly giving a description of his dueling doughnuts, all three items had won first prize in the three categories of the advanced section. 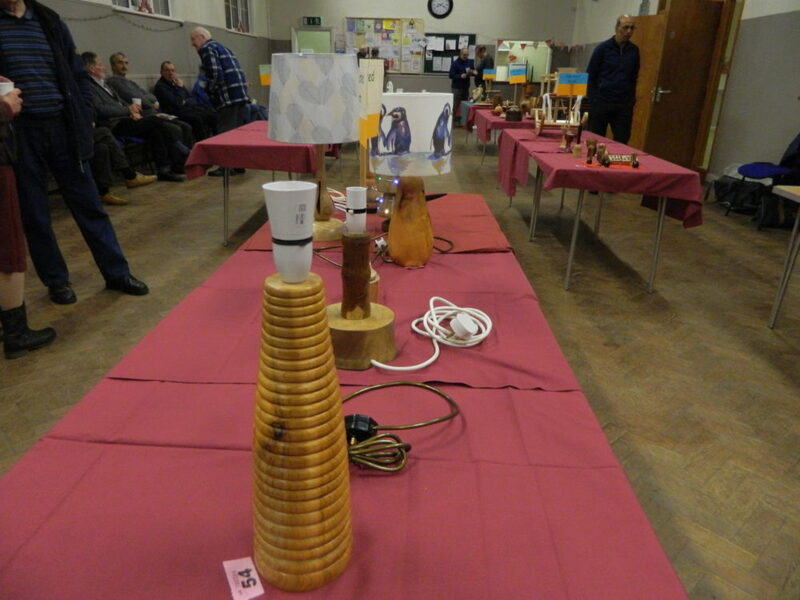 The dueling doughnuts that also won most innovative item was explained in detail. 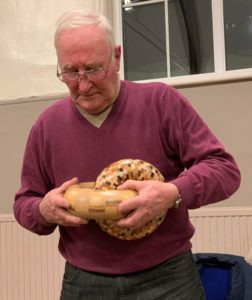 One doughnut (pictured above) contained 1,248 blocks. 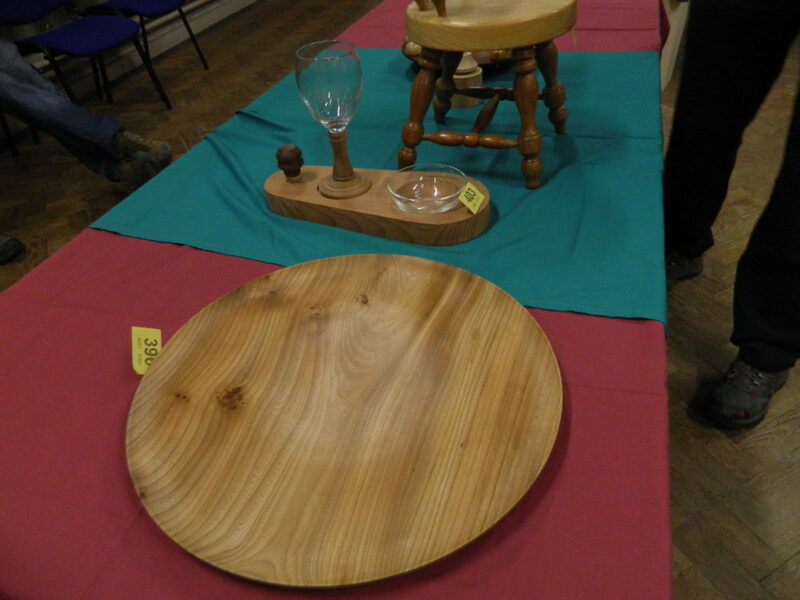 Next was Dave Workman to explain his bowl with a rim containing Tippy Tops. 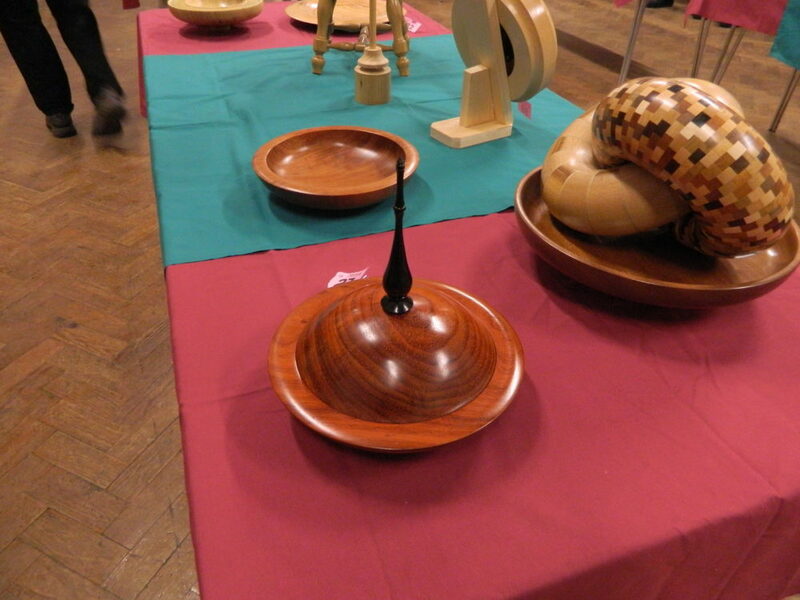 These spinning tops, when spun, turn 180° and continue spinning on the stalk. 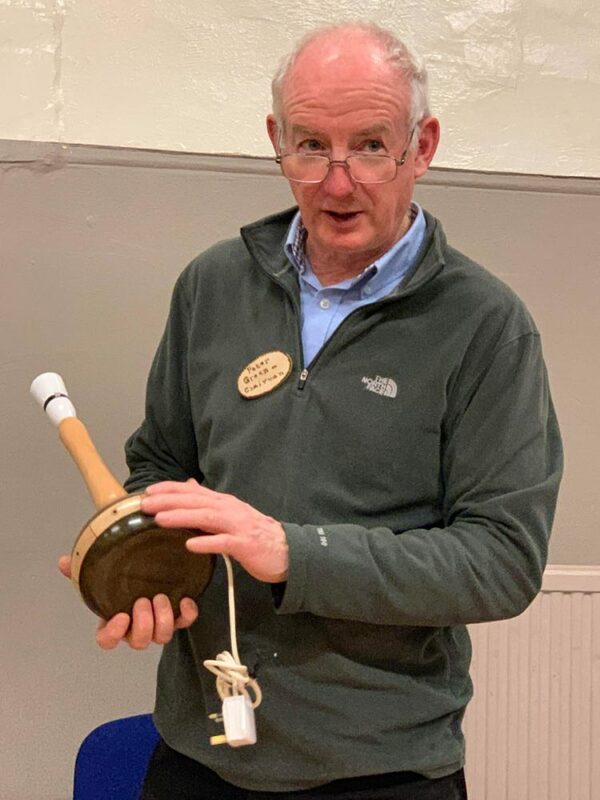 More can be seen on our Facebook page where Dave demonstrates a very large Tippy (or Tippee) top. 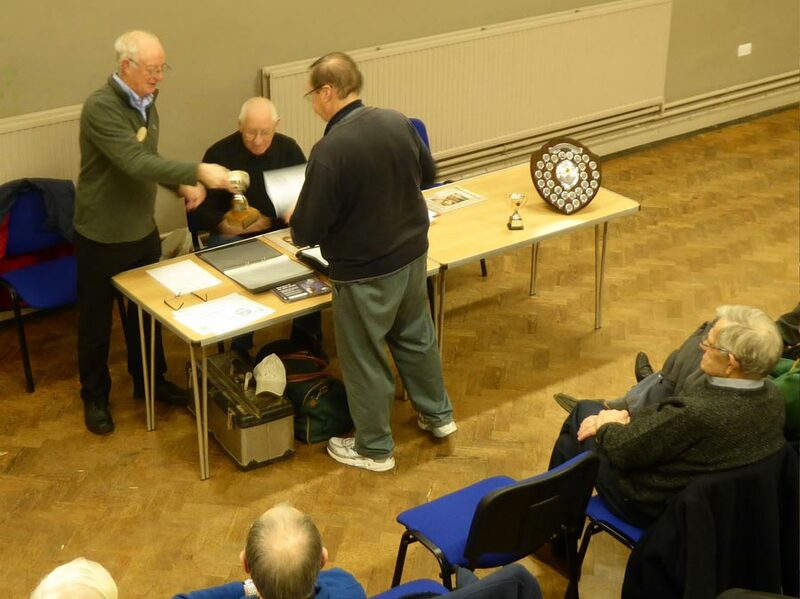 Below are more photos of the Award Presentation evening. 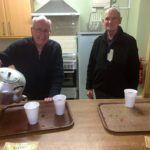 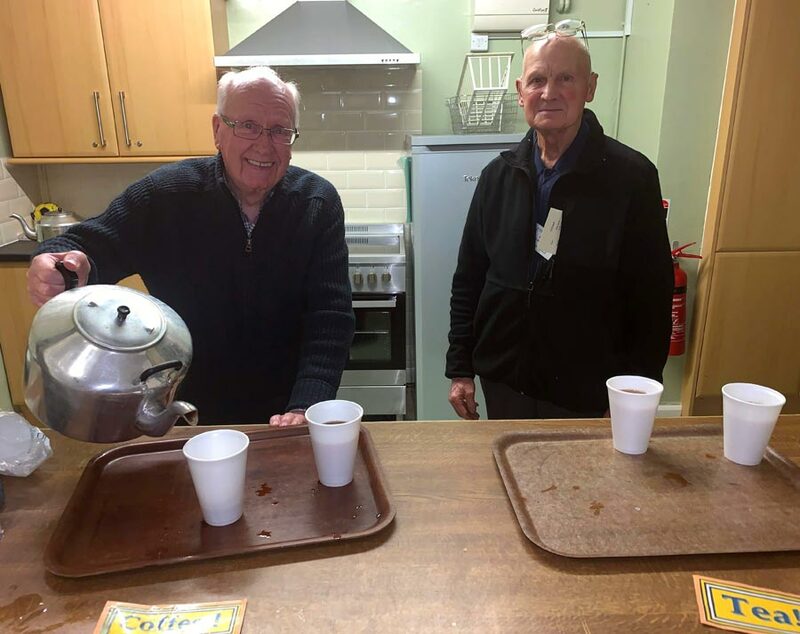 Another great summary Peter I like the photo of Ted and Frank doing an vital essential service tea and coffee or the club.